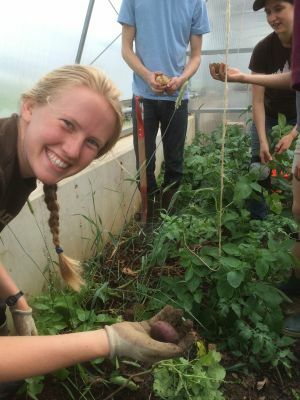 The Agroecology Summer Intensive (ASI) is a 10-week 15-credit accelerated semester intentionally designed to serve students from both Goshen College and students from other colleges and universities. Tuition – Goshen College Students: Taking ASI is simple! At Goshen College the ASI experience is treated just like any other semester. You can use your financial aid just like you would any other semester at Goshen. Contact John Mischler (jamischler@goshen.edu) to get started on your ASI application. Tuition – Guest Students from other Colleges & Universities: . Please contact John Mischler (jamischler@goshen.edu) to find out if your college or university has a special agreement for students to take the ASI experience here with us. If not, no worries! Students from non-affiliated institutions come to take ASI with us all the time! Please contact John Mischler and he will work with you and your college or university to determine the specifics of your individual tuition package; limited tuition assistance is available. The first step is submitting your ASI application. Room & Board: You will be living, working, and eating in community from our LEED Platinum certified cottages situated right here on our farm. Total Room & Board costs for ASI 2019 are $172.50 per week. Included in your Room & Board is a CSA share of vegetables from our farm as well as meat, eggs, milk, and cheese – all raised right where you live! Additionally, basic bulk goods are also provided (rice, flour, etc.). Typical student food costs run about $10 per week. The program is 10 weeks in length with an optional internship offered at no extra tuition cost after the end of the 10 weeks. Certificate Option: If you do not need college credit but are still interested in the full suite of experiences offered as part of ASI please contact John Mischler for more information.